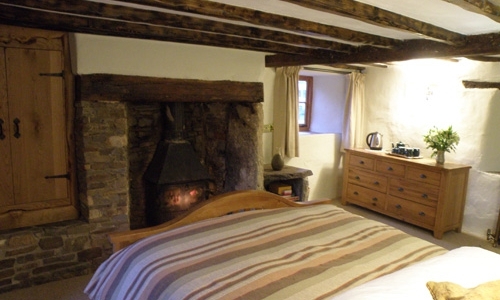 King-size bed on ground floor with log burner. En-suite with shower & Jacuzzi bath. One of our larger rooms fitted with Louis XV king size bed with an organic mattress. King-size bed, quaint room with heaps of character. En-suite shower room. King-size bed with very comfortable double sofa bed. Ideal family room. Relax, Unwind and Enjoy a slice of Devon…. Hay Meadow Farm (formerly Haye Farm) is a 12th century thatched manor house with origins dating even further back. 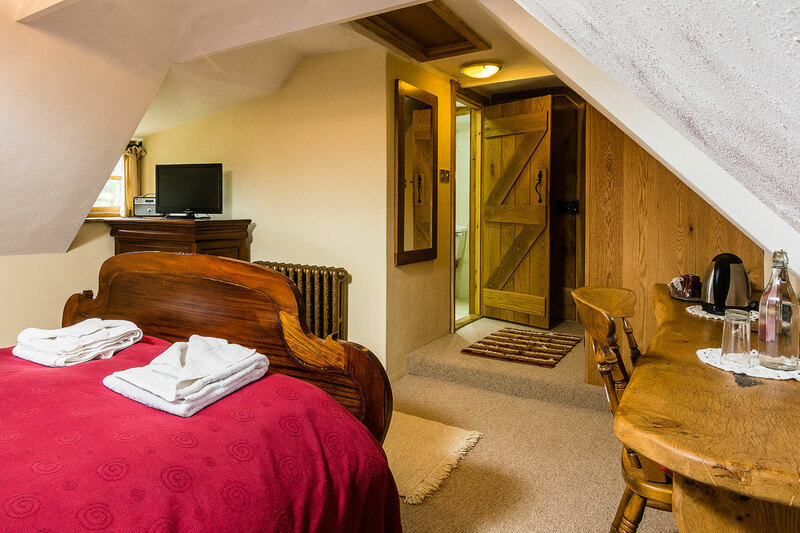 Mentioned in the Doomsday Book the farm is steeped in history and the cottage with its inglenook fireplaces and exposed wooden beams is brimming with character. 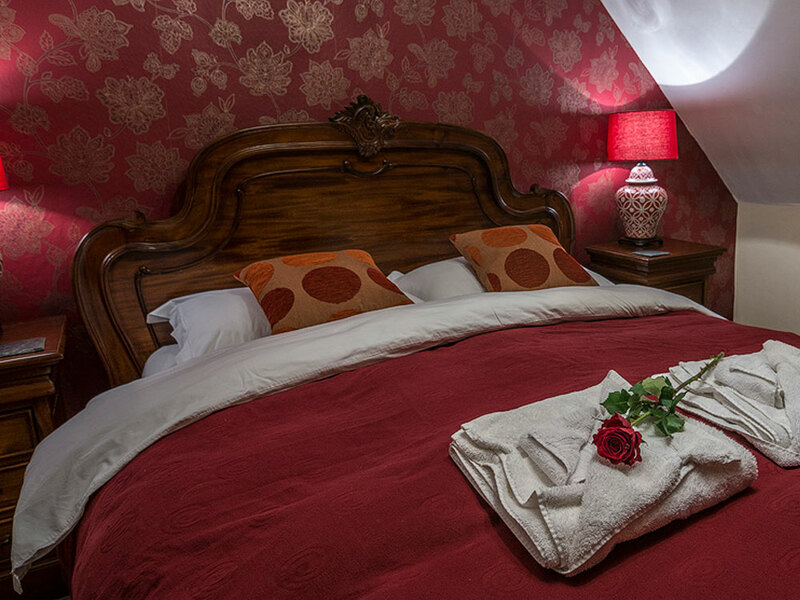 Each room is tastefully decorated and very loosely themed around wild meadow flowers. The bedding is 100% natural cotton, mattress that are organic, luxurious and extremely comfortable, even the curtains are handmade from organic hemp. The carpets are pure wool, light fittings are hand forged iron and combined with the wood and stone of the building the feeling of everything being natural adds to the sense of history. Enjoy a fresh organic home cooked meals served in the Cafe or relax in the comfort of the lounge room, with it’s 800 year old fireplace, exposed beams and even a creamery where they would have once made the traditional Devonshire clotted cream. 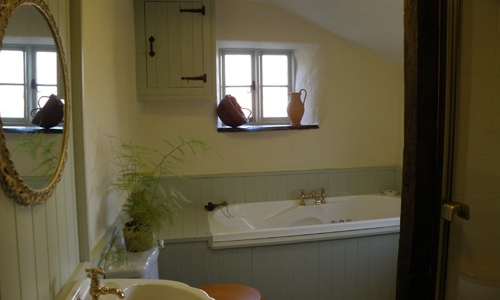 Situated in an extremely rural setting the manor house and meadows are very tranquil indeed. Surrounded on three sides by woodland and with meadow on the other you can really get the sense of privacy and seclusion. With some of the darkest night skies in britain on a clear night you can see the stars in all their heavenly splendor. Receive Discounts & Special Offers. With gentle hints of green. Located on the ground floor the Clover Room is best suited to any guest requiring the easiest access (please note there are still a few steps to the en-suite of this room). A large king size bed with a luxury mattress that is extremely comfortable. 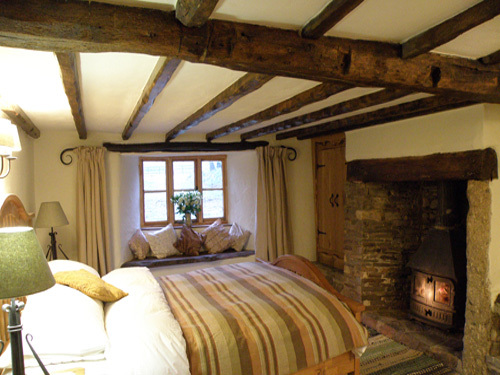 Exposed beams and an inglenook fireplace give this dual aspect room heaps of character. 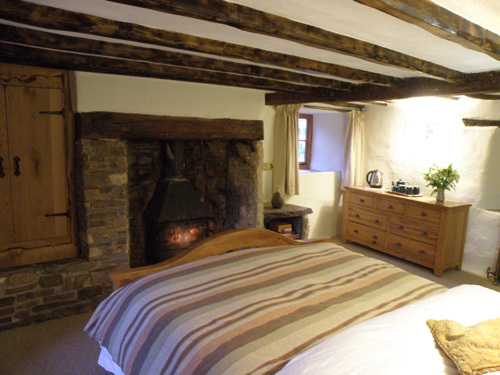 This room also features a log burner to add that extra touch of cosy romance. 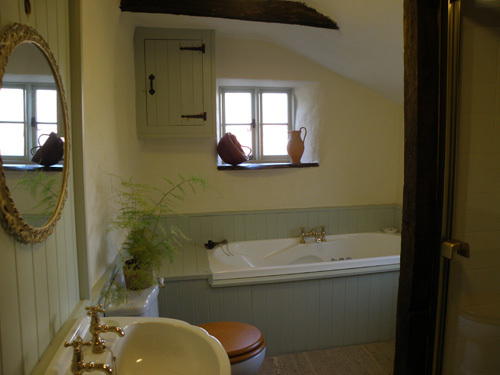 The large en-suite bathroom features a jacuzzi bath and separate shower. Price quoted is per room per night and includes breakfast. * applies to bookings made by telephone or email only. One of our largest bedrooms The Orchid room has dual aspect to the front and the back of the house. Fitted out with Louis XV bedroom furniture this room features a king size bed with an organic mattress. As well as the usual set of draws and wardrobe this room also features a desk and wi-fi internet so ideal if you need to do a little work while here. The room is decorated in neutral colours with splashes of deep red combined with the rich mahogany colours of the furniture bring the aspect of the deep red variety of the wild meadow orchid. 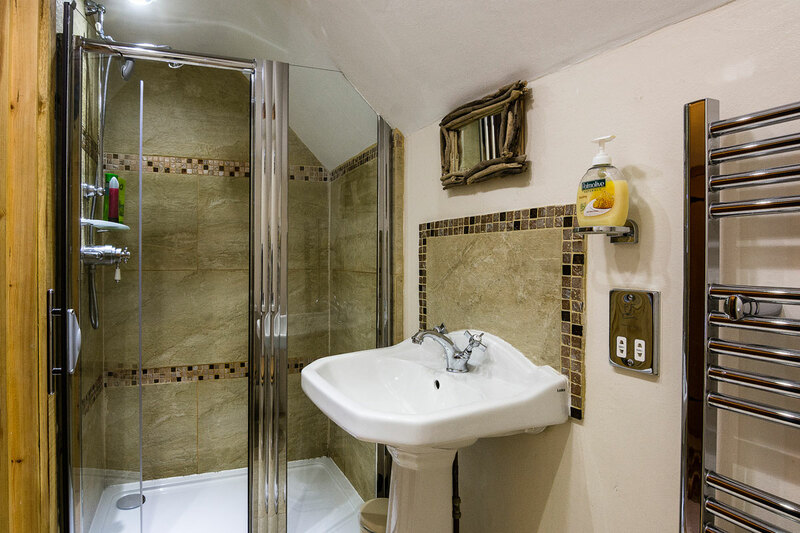 The orchid room has a good size en-suite shower room. One of our personal favorite rooms The Daisy Room maybe the smallest bedroom but it is just oozing with character and charm. 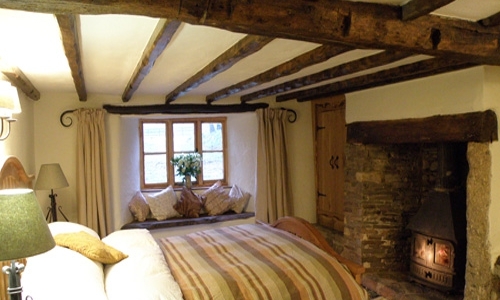 Quirky beams and very old oak panels The Daisy Room is cosy and warm. Overlooking the front of the house it has a beautiful view across the garden and meadows. 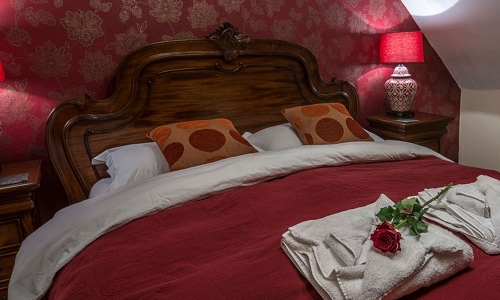 With a good size en-suite shower room, king size bed with organic luxury mattress. The room is decorated with subtle shades of cream and yellow. *applies to bookings made by telephone or email only. A quirky room indeed. A large bedroom featuring a king size bed with organic mattress. Built in wardrobes, draws and a writing desk. 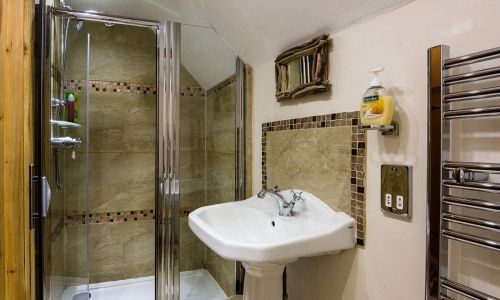 This room has a small en-suite shower room. 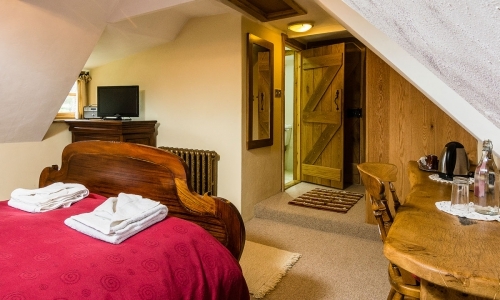 The Buttercup Room also has a comfortable sofa bed and therefore would be advised as our only family room sleeping up to 2 adults and 2 children. The room also features an oak desk with wi-fi internet. A very cosy yellow decoration that goes someway to express the exuberance of the buttercup.